Uit een studiegroep van 34 patiënten met glioblastoma multiforme graad IV die pas na een recidief na een standaard eerstelijns behandeling dendritische celtherapie kregen waren de resultaten beduidend minder maar nog wel beter dan met alleen een standaard behandeling. Mediane overall overleving was voor deze groep 10 maanden. Deze studie is uitgevoerd door de artsen van de privè kliniek van dr. Nesselhut: http://www.immune-therapy.net/ En afgelopen weekend presenteerden zij hun studie op ASCO 2017. Resultaten: Verbetering van de klinische respons werd waargenomen bij patiënten, die alleen een combinatiebehandeling kregen van het Newcastle Disease Virus - NDV met Monocyten derived Dendritic Cells (MoDC) in vergelijking met alleen MoDC, (47% versus 11%). De mediane overleving na aanvang van de Dendritische Celtherapie was 3 maanden alleen met MoDC en 10 maanden (23 maanden na primaire diagnose) in combinatie met het Newcastle Disease Virus - NDV. De 1-jaar-overlevingspercentages na aanvang van de DC-therapie waren respectievelijk 6% en 32%. De therapie werd goed verdragen zonder enige belangrijke bijwerkingen. Results: Improvement of the clinical response was observed in patients, who received combination of NDV with MoDC vs. MoDC alone (47% vs. 11%). The median survival after onset of DC-therapy was 3 months with MoDC alone and 10 months (23 months after primary diagnosis) in combination with NDV. The 1- year-survival rates after onset of DC therapy were 6% and 32%, respectively. The therapy was well tolerated without any major side effects. Of deze nieuwe studie ook patiënten uit de vorige studie beschrijft durf ik niet te zeggen. Waarschijnlijk niet want de eerdere studie was al in 2011. En deze studie spreekt over 3-jaarsmeting, dus is waarschijnlijk nieuwe studie. In de abstracten wordt hyperthermie niet genoemd maar ik weet dat patiënten standaard ook hyperthermie erbij krijgen. Hier het abstract zoals dat werd gepresenteerd en wellicht kunt u hun volledige studierapport opvragen als u contact met hun opneemt. Dendritic-cell based immune therapy started immediately after primary standard therapy has a clear impact on the overall survival of patients with newly diagnosed GBM IV. Whereas the therapeutic effect for patients after failure of first-line therapy is limited. 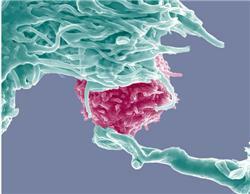 Nivolumab may cause secondary therapy response in certain patients. Comparison of early versus late onset of cellular immunotherapy in glioblastoma multiforme WHO IV. Background: Glioblastoma multiforme (GBM WHO grade IV glioma) is an aggressive disease with an unfavorable prognosis. The current first line treatment comprises radical operation and radiotherapy combined with temozolomide chemotherapy (Stupp protocol). After failure of first-line therapy there is currently no effective therapy. Here we report that dendritic cell therapy prolongs the survival for patients with newly diagnosed GBM V. Preliminary results show that adding checkpoint blockade with Nivolumab may cause a secondary therapy response. Methods: After isolating monocytes from peripheral blood of n = 11 patients with stage IV GBM, who underwent primary surgery and first-line radio-chemotherapy and from n = 34 patients, who failed first line therapy MoDC were generated using standard protocols. In 5 patients checkpoint blockade with Nivolumab was added after failure of DC therapy. Results: With a median overall survival of 41 months there is a clear improvement of the overall survival in patients, who received DC therapy after having finished the Stupp-protocol. The 3- year-survival rate after primary diagnosis is 46% (n = 5) and 1 patient is still alive after 81 months. In this patient a secondary therapy response of 16 months could be induced by adding low dose Nivolumab (1mg/kg body weight) after failure of DC therapy. The median survival after onset of DC therapy in patients who failed first line standard therapy is 10 months. The 3-year overall survival rate is 9% (n = 3). In 4 patients therapy with Nivolumab was combined causing only a limiting effect on the survival (4 to 10 months). Conclusions: Dendritic-cell based immune therapy started immediately after primary standard therapy has a clear impact on the overall survival of patients with newly diagnosed GBM IV. Whereas the therapeutic effect for patients after failure of first-line therapy is limited. Nivolumab may cause secondary therapy response in certain patients. Reageer op "Dendritische celtherapie bij glioblastoma multiforme graad IV direct na bestraling plus temodal geeft langere overall overleving. 46 procent leeft nog na 3 jaar"